Instead of forcing them into one specific sport let them pick out a few different ones that they want to try out. Having them pick out the sport will make it more fun because it was their decision, and getting to try a variety of different ones will help them decide which sports they like and which ones they don’t like. Playing sports should be a fun activity, not a chore, so avoid forcing them to play a particular one, and let them experiment until they find the one best suited for their interests. It’s virtually impossible to be inactive at a park with all the different things to do. They can run around the playground, climb trees, hike trails, and throw balls or Frisbees to one another – all of which will get their hearts pumping without seeming like required work. Kids spend so much time indoors simulating experiences that getting out and enjoying fresh air and stretching their legs will be good for them. You can’t expect your kids to want to be active if you’re not active too! Set a good example for them by taking family bike rides after school and work together or walking around the neighborhood. It’ll be more fun if everyone is involved, allow time spent together as a family, and get some exercise in before the day is done. Now that warmer weather is approaching it’s time to bust out the swimsuits and have some fun. Set out the sprinkler and let the kids run through it in the front yard, go visit the neighborhood pool and bring diving toys for the kids to retrieve, and take weekend trips to nearby beaches or lakes. Swimming is a great workout and they’ll be having so much fun they won’t even realize its considered exercise. Video games are almost unavoidable these days, so if you are going to let them play video games at least get them one of the consoles that allow them to get up and move around while they’re playing instead of being sedentary on the couch the entire time. Plus, these active types of video games are the perfect solution to rainy days where they can’t be outside running around. 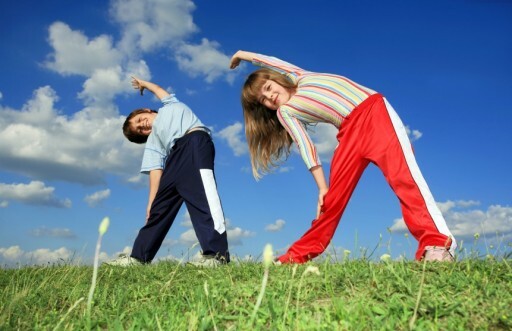 Fitness doesn’t have to be a chore that kids have to check off a to-do list! Instead make it a fun experience so that they want to do it by taking it outdoors and making it a game as much as possible. The more fun they’re having the more likely they’ll readily choose to participate. Heather Smith is an ex-nanny. Passionate about thought leadership and writing, Heather regularly contributes to various career, social media, public relations, branding, and parenting blogs/websites. She also provides value to hire a nanny by giving advice on site design as well as the features and functionality to provide more and more value to nannies and families across the U.S. and Canada. She can be available at H.smith7295@gmail.com. This entry was posted in Guest Post and tagged heather smith, making fitness fun, nanny by Get Kids Outside. Bookmark the permalink.